For the song, see P. Funk (Wants to Get Funked Up). P-Funk (also spelled P Funk or P. Funk) refers to the repertoire, musical style, and/or group of performers associated with George Clinton. The term is variously known as an abbreviation of Parliament-Funkadelic, Psychedelic Funk, Pure Funk, or Plainfield Funk. The P-Funk groups had their heyday in the 1970s and continue to attract new fans thanks both to the legacy of samples they bequeathed to hip hop and the live shows that the bands continue to perform. Their music was very aspirational, which is symbolized by their Mothership that has since been acquired by the Smithsonian. Notable P-Funk albums include Funkadelic's Maggot Brain and Parliament's Mothership Connection. The differing styles of these albums showcase the wide range of P-Funk's music. "Maggot Brain was an explosive record" of Jimi Hendrix inspired rock while Mothership Connection was an "album of science-fiction funk." 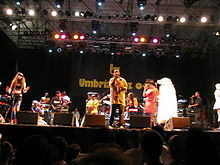 While this rock/funk differentiation is what normally separated Funkadelic from Parliament, the bands consisted of many of the same members and performed live on tour together. Hence, the two groups are often described under the one moniker Parliament-Funkadelic. P-Funk recordings have been 'extensively' sampled in rap and hip-hop music, especially by Dr. Dre and other West Coast acts, beginning in the late 1980s and being particularly associated with the G-funk style of rap. The etymology of the term P-Funk is subject to multiple interpretations. It has been identified alternately as an abbreviation of "Parliament-Funkadelic", "pure funk" or "Plainfield Funk", referring to Plainfield, New Jersey, the hometown of the band's original line-up. The liner notes of CD versions of the Motor Booty Affair album suggest that the "'P' stands for 'Pure.'" The breakout popularity of Parliament-Funkadelic elevated the status of P-Funk to describe what is now considered to be a genre of music in its own right. According to Clinton, "We just took a combination of James Brown, Horn Players, Bootsy [Collins], Catfish, Sly Stone, took the funky psychedelic and rock ‘n’ roll elements together and called it P-Funk". ^ "Funkadelic: Funkadelic / Free Your Mind / Maggot Brain / America Eats Its Young Album Review - Pitchfork". pitchfork.com. ^ "Dr. Dre Perfected G-Funk, But He Didn't Invent It—Gregory Hutchinson Did". Complex. Retrieved 2018-07-24. ^ "P-Funk (aka Pure Funk) - Music Genres - Rate Your Music". rateyourmusic.com. Retrieved 2018-07-24. ^ "Delineating the funk with George Clinton | Crack Magazine". Crack Magazine. Retrieved 2018-07-24.